The other day I spent what seemed like ages in front of the food writing section at McNally Robinson Booksellers. While it probably was closer to twenty minutes, I did handle almost every book in the section. It was the literary equivalent of walking up and down the deli aisle, unable to decide on what kind of meat to choose for your sandwich. 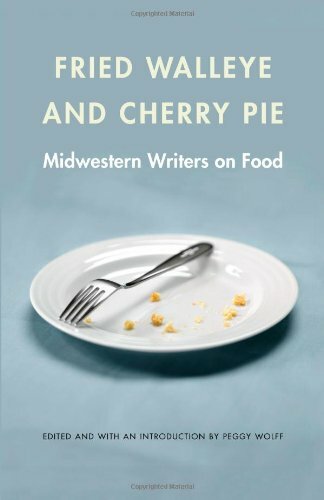 I picked up the book Fried Walleye and Cherry Pie: Midwestern Writers on Food, edited by Peggy Wolff. Fried Walleye goes beyond the food itself and takes the reader into the world of farmers, fishers, and families. These are stories about discovering new cultures that the writers weren’t part of, and rediscovering old cultures that the writers thought they had left behind or outgrown. The many writers who contributed to the book are generally well established, and in many cases, award winning writers. While only some of the chapters contain recipes, each chapter will leave your mouth watering for the food described within. Many chapters may even stir up memories that you thought were long forgotten. Perhaps the stand-out characteristic is that the books successfully navigates through the worlds of many different types of eaters. It doesn’t attempt to make an exhaustive journey through the exhaustive sub-genres of foodie experience. Instead it helps the reader to understand that in the various approaches to food that we find ourselves inundated with, there are two common themes. The desire for good food and the desire for loved ones to share it with is at the heart of most of our food experiences. The book is divided into 30 chapters. I devoured it quite quickly, but it can just as easily and perhaps even better, be read on a chapter a day basis through the course of a month. That way you will be able to savour the stories in much the same way you might savour a good meal. Much like there is much under the surface of Midwestern towns, there is much under the surface of the stories in this book, making it the kind of book you will wish to return to again and again, like a favourite comfort food.